Antiterrorism, contrary to what the term would suggest, is not a means to fight against terrorism, it is the method by which the political enemy is positively produced as a terrorist. It is a matter, by a luxury of provocation, infiltration, surveillance, intimidation and propaganda, by a whole science of media manipulation, “psychological action”, the production of evidence and crimes, by the fusion also of the police and the judiciary, to annihilate the “subversive threat” by associating, within the population, the inner enemy, the political enemy, to the affect of terror. What is essential, in modern warfare, is this “battle of hearts and minds”, where all blows are allowed. The elementary process here is invariable: to individuate the enemy in order to cut him off from the people and common reason, to expose as a monster, to defame him, to humiliate him publicly, to incite the vilest to cover him with their spit, to encourage them to hatred. What is, before us, is a bifurcation, both historical and metaphysical: either we move from a paradigm of government to a paradigm of living at the price of a cruel but overwhelming revolt, or we allow to be establish, on a planetary scale, this air-conditioned disaster where there coexists, under the rule of an “uninhibited” management, an imperial elite of citizens and plebeian masses held to the margins of everything. So there is, indeed, a war, a war between the beneficiaries of the disaster and those who make of life something less skeletal. A ruling class has never been seen to heartily commit suicide. 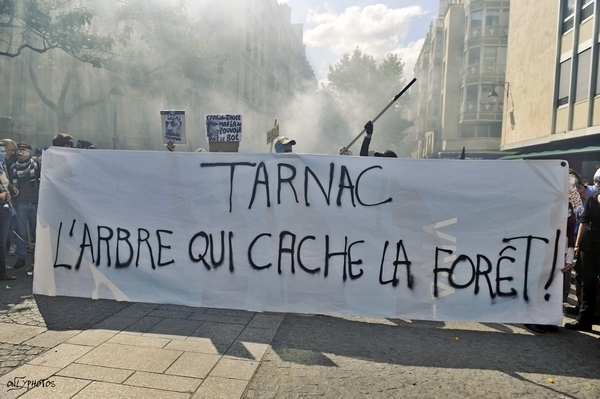 The CrimethInc Collective offers a chronicle and an analysis of the significance of the french state’s effort to condemn the “Tarnac Group” for terrorism; an effort that concluded this last week in failure. Yet it is a failure from which lessons should be drawn. All the undercover cops in the world cannot stop a protest whose time has come: Mark Kennedy and his handlers failed to prevent the G8 protests in Great Britain, as we described in “Can’t Stop the Chaos.” While Mark Kennedy focused the attention of the London Metropolitan Police on arresting the WOMBLES at a pub in Glasgow, he completely missed the primarily German black bloc that emerged to wreck havoc from a seemingly eco-hippie camp outside Stirling. To prevent this from recurring in the future, he was ordered to infiltrate the infamous “German Autonomen” that were to be key in the 2008 G8 in Heiligdamm, Germany. After gaining the trust of the notoriously security-conscious German anarchists by burning a car, his attention turned to a group of French revolutionaries, including Julien Coupat, a participant in Tiqqun. The excuse the state put forward was that co-ordinated sabotage had taken place along four lines of the French national SNCF train system on the evening of November 7, utilizing a technique from the German autonomous movement in which the saboteur places an iron claw on the electrical lines of the railway so that the claw “unplugs” the electricity of the train. The purported sabotage occurred on the day that the infamous Castor nuclear trainscarried nuclear waste from France to be dumped in Western Germany. Local farmers and various German movements have protested these nuclear waste transports for decades. The same evening that the train lines in France were shut down, a communiqué in German was sent to newspapers claiming the anti-nuclear action. “Everybody knows it’s about to explode!” chanted occupiers at an impromptu release party in Barnes and Noble for the English translation of The Coming Insurrection in New York City.4 And explode it did. As the anti-terrorist operation was rounding up the supposed masterminds of a new terrorist network throughout France, the financial crisis of 2008 pitched the world into global crisis, underscoring that the greatest risk to humanity is not those who threaten the system, but the system itself. As hatred of the banking system increased, riots spread throughout Europe like flames from a Molotov cocktail. Although there was no international barbarian horde to tear down the gates of the G8 at Deauville in 2009, it was because no one besides the police even cared: the G8 was clearly impotent in the face of generalized financial meltdown and increasingly decentralized unrest. The “investigating magistrate”7 Thierry Fragnoli behaved like a jilted lover. After announcing to a journalist that he wanted to be played by Brad Pitt in a movie about Tarnac, he ordered more house raids and arrests in Rouen in hopes of turning up actual evidence of terrorism. Fragnoli imagined that Charles Torres, a blacksmith and the grandson of a Spanish anarchist veteran, had manufactured the iron claw used to shut down the train lines. However, during a house raid, the blundering French police accidentally left a dossiercontaining files on everyone they were surveilling in Rouen on the table—along with one of their police phones, which they had to meekly return to pick up! When the dossier and personal emails expressing his virulent hatred of the defendants were leaked to the French press, Fragnoli sent a paranoid letter claiming that a conspiracy existed between the French media and Julien’s Jewish lawyer, Jérémie Assous. This letter was duly published in the media. In response to subsequent pressure, Fragnoli quit the case and was effectively Limoged3 to a French colony in the Pacific, Petite-Île. At the same time, in the end, the prosecution was able to avail themselves of all the special resources reserved for pursuing terrorism cases to target what turned out to be a handful of perfectly ordinary activists. All the evidence gathered under the auspices of “fighting terrorism” was still admissible in the trial. The lead anti-terrorist prosecutor was still prosecuting the case, despite the merely criminal nature of the trial. Above all, the tremendous, debilitating repression reserved for terrorism cases was directed at paralyzing the defendants and their communities. This gives us a foretaste of what we can expect from the security apparatus in the future. We can see this process somewhat further along in Russiaand Brazil. This entry was posted in Commentary and tagged france, Invisible Committee, Security State, State and terror, Tarnac, Tiqqun. Bookmark the permalink.